Robert Fichter is an American photographer known for combining drawing and photoengraving processes into his work. He has titled this technique Print-Photo-Fusion. Fichter studied under Jerry Uelsmann and Henry Holmes Smith, who both had a significant impact on his work. In 1966, Fichter met Nathan Lyons and ended up working for him at George Eastman House as an assistant curator until 1968. Lyons started Visual Studies Workshop in 1969, and Fichter has since maintained an association with VSW. Fichter has also been a professor at a number of schools throughout his career. This is another of the images from the series that Fichter did of Alice Wells using the Diana camera. This plastic camera is often referred to as a toy camera, along with the Holga. Due to a deformity in the film reel, there was a light leak. Fichter liked the effect that this caused so much that he continued to reuse the bent original reel to replicate this. 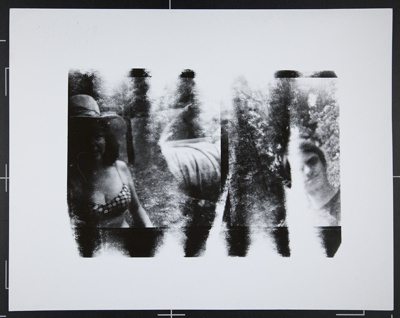 This print has a hair that was on the negative during printing and is visible on Alice Well's face.